If you're having doubts about where is Sicily, the answer is simple, it’s the very tip of Italy's "boot". There are many reasons why you should visit Sicily, and here are some handy travel recommendations. Which part of Sicily is the best to visit? There are many cities in Sicily worth visiting from the capital of Sicily, Palermo, to the southern Valle di Noto towns. The island is scattered with remarkable wonders be they historical, natural, cultural or simply stunning locations, thus, no matter where you stay, there'll always be an allure to explore the multi-sided island. Generally, most travelers prefer to stay in the southern part of Sicily. The hotter months of the year from mid-June to the end of August are considered to be not the best months for Sicily travel. The reason for that, apart from boiling hot outside temperatures, are the large tourist crowds which mean higher prices, full hotels, cafes, transport, and a bunch of people by about any point of interest. Therefore, it is advisable to go on a Sicily vacation in spring and autumn. 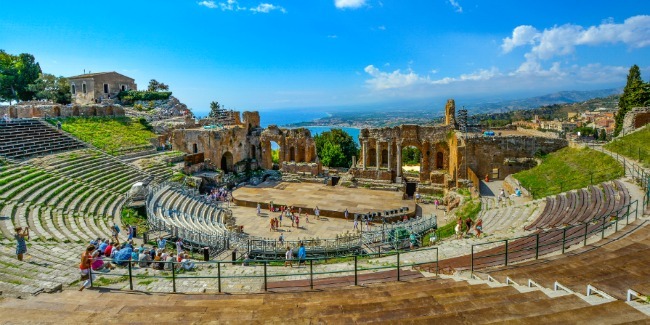 Sicily tours are a perfect way to combine laid-back vacation time with plenty of sightseeing. Among the best places to visit in Sicily is the Valley of Temples near Agrigento with perfectly preserved ancient Greek ruins. Other places not to miss in Sicily are such unique towns as Erice, Monreale, Taormina, Syracuse, and Val di Noto towns, to name a few. Still thinking about what to do in Sicily?What's for natural wonders, the limestone Scala dei Turchi cliffs, as well as a rise to Mount Etna volcano by Catania for a sneak peek at the crater and a tasting of delicious wine right on the slopes, are among other musts. Sicily: How to get around? Sicily island is quite hilly and thus there are no high-speed trains. Luckily there’s a lot of public transport available, including buses and minibusses. Plus, if you have time to spare, you’re always free to rent a car and travel wherever you'd like on the island.